An Australian senator has apologised for wiping his own blood on a fellow lawmaker’s door after having a scuffle in the halls of parliament. 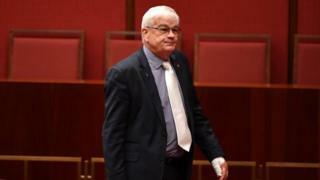 Senator Brian Burston was involved in a clash on Wednesday with James Ashby, an aide to Senator Pauline Hanson. The incident is being referred to police and has led to Mr Ashby being stripped of his parliamentary pass. Mr Burston told the Senate that he did not recall putting blood on Ms Hanson’s door, but nonetheless conceded he had. It follows both senators making allegations of sexual harassment. Mr Burston is a first-term senator who quit Ms Hanson’s anti-Islam One Nation party last year after a feud, and later joined the United Australia Party. Ms Hanson is a political veteran and a frequent figure of controversy, recently drawing criticism for wearing a burka in parliament and sponsoring a bill which stated “it is OK to be white”. Mr Ashby is her chief of staff. Earlier this week, Ms Hanson used parliamentary privilege to accuse an unnamed senator of sexual harassing at least six staffers. Mr Burston later said that he believed Ms Hanson was speaking about him, and strongly denied the allegations. He then accused Ms Hanson of making unwanted advances towards him, alleging that in one incident she had run her hands along his spine. Ms Hanson denied the allegations, telling local network Seven they were “an absolute joke”. What is known about the fight? Video published by News Corp Australia showed Mr Burston and Mr Ashby pushing each other in a parliamentary foyer and a corridor. It followed a function they had both attended. Images later showed Mr Burston’s hand injured, and blood smeared on the door of Ms Hanson’s office. Mr Burston asserted the footage had not shown the scuffle’s full impact. What then happened in the Senate? On Thursday, Senate President Scott Ryan said he had revoked Mr Ashby’s parliamentary pass following an investigation. “Senators must be free to go about their work in this building,” Mr Ryan said. Mr Ashby later said he had surrendered his pass but demanded a “full investigation into this matter”, local media reported.